EDIT - There will be no fireworks at Mount Rushmore in 2010. The fire danger caused by pine beetles killing trees around the area has become a major concern. there will be entertainment of some kind on July 3 and 4 at Mount Rushmore, but no large aerial fireworks display. I've had several people ask me about the best angle to shoot the fireworks at Mount Rushmore from, so here are some suggestions. You will find that almost all angles will work well. The fireworks are usually so huge that you will see them above the faces from anywhere. The picture above was taken from the main viewing platform, and is the "classic" view of Mount Rushmore that almost everyone who visits sees. I'm very happy with this angle and so it seems are the many publications that have used my images from this spot. Since the reason you are at Mount Rushmore is because of those famous faces, you may want them to be a bit larger in the frame. To achieve that, I would suggest being as low in the amphitheater as possible. You will most likely have to arrive quite a bit before noon to reserve your spot with a blanket or other items left on the seats. Being low in the amphitheater will give you a bit steeper angle looking up, which brings the fireworks themselves down a bit toward the heads instead of so high above them. I hope that helps and I also hope that everyone finds an angle they like for the show. Let's not see everyone fighting for tripod space at the bottom of the amphitheater. Remember this is supposed to be fun and you will get great shots from almost anywhere you can view the faces. For more info, check out my earlier post at Rushmore fireworks. 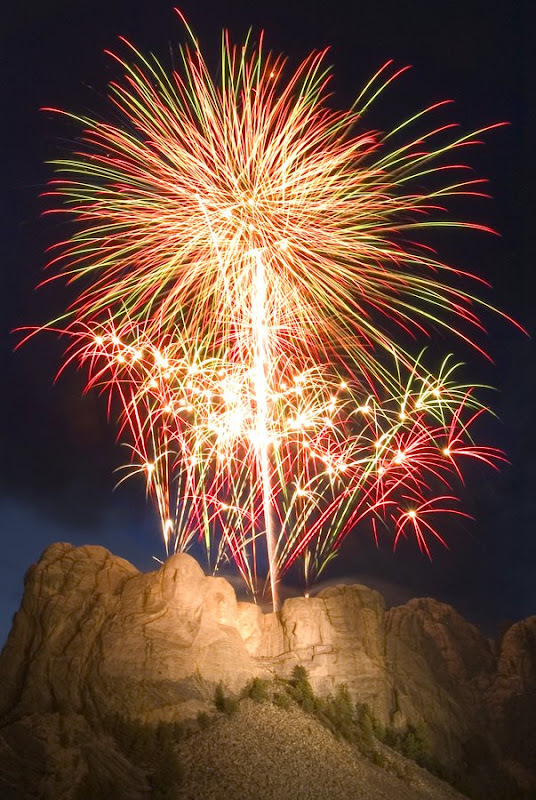 PS - There is a full schedule of the July 3 activities at Mount Rushmore listed at South Dakota Tourism. the picture of Mount Rushmore with the fire works above,answers a question my son has, whats the big deal, its just fire works. My son works at Walmart in Rapid City and he went to lunch at a fast food place, but when he went back to work, the traffic was so backed up (people preparing to go to the fire works at Rushmore) He could not get in to Walmart's parking lot, intersections were jammed. He has never seen them as this is his 1st year in Rapid, so I search and found this picture, I think this picture should explain to him what the big deal is- that is stunning- again- thank you. Thanks for the comment! I was already at Mount Rushmore yesterday by lunchtime, so didn't see most of the traffic. I'm surprised to hear it was backed up into Rapid City. Unfortunately, I have to report that last night's fireworks were fogged out. The show did go on as scheduled, but it was mostly just a lot of noise and some colored glows in the sky. Mother Nature wins again, but the show is very spectacular when you are able to see it. I'll plan to be there again next year to capture whatever happens. I'm still on the road now, but will post a picture of this year's "fogworks" when I get back on Monday.